This Green Vista 2 Pack of Clear for Ponds 32 Ounce Refill is designed for use in Aquascape Automatic Water Treatment Dosing System # 96030. That system automatically adds the treatment to its pond throughout the day, providing and maintaining optimum water quality and clarity. These two bags of Aquascape Clear will treat up to 2,500 gallons of pond water for about 2 months, with each bag treating the water for about 1 month. Each bag contains 32 ounces of the treatment. The Clear treatment is made for ponds containing fish and plants. Koi, other kinds of fish and plants are safe if they live in a pond treated with Clear for Ponds. Clear's ingredients include sludge eating bacteria and enzymes. They reduce the fish waste, unused fish food, fallen leaves and other organic debris in a pond. In addition to Clear for Ponds, Aquascape makes 3 other treatments for its Automatic Water Treatment Dosing System # 96030. The other 3 treatments (also available in 2-packs) are Clean for Ponds, Maintain for Ponds and Protect for Ponds. The Clean treatment decreases fish waste, uneaten fish food, leaves and other organic debris for optimal water clarity and quality. The Maintain treatment improves pond water's quality and clarity then keeps them ideal, reducing pond maintenance. Protect, made of plant extracts, lowers fish stress and prevents fish parasites and bacterial infections. Safely clarify your pond containing fish and plants with this Green Vista 2 Pack of Clear for Ponds 32 Ounce Refill. TWO CONVENIENT PACKAGES: The Green Vista 2 Pack of Clear for Ponds 32 Ounce Refill is designed to be used with the Aquascape Automatic Water Treatment Dosing System # 96030. These 2 containers of Aquascape's Clear will treat up to 2,500 gallons of pond water for about 60 days, with each 32 ounce container treating the water for about 30 days. MADE FOR PONDS WITH FISH AND PLANTS: Because Aquascape Clear can be added slowly and consistently to a pond, it is safer for fish and aquatic plants than products that shock treat pond water with a single treatment. Using Clear for Ponds with the Aquascape Automatic Water Treatment Dosing System # 96030 ensures its slow release. ELIMINATES DISCOLORED AND CLOUDY WATER: Use Clear to provide optimum water quality and clarity in your pond. Efficiently and effectively, it clears unattractive water conditions. 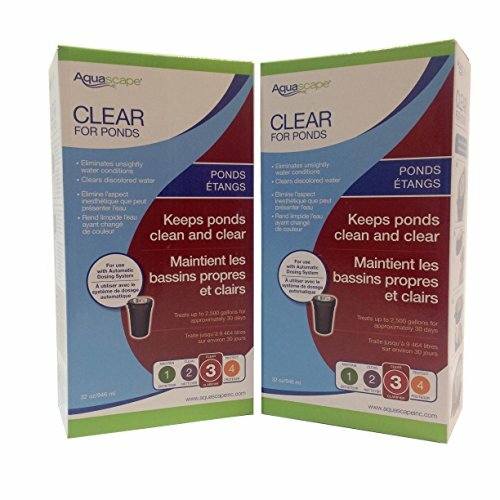 HELPS KEEP WATER CONDITIONS IDEAL: Clear does not stop with improving the quality and clarity of a pond's water. It continues to work by helping to maintain those pristine water conditions. DECREASES ORGANIC WASTE: Clear's enzymes and sludge-eating bacteria are key to optimizing the water's quality and clarity. They handle fish waste and uneaten fish food as well as fallen leaves and other debris.